The Planet Express headquarters is located on the west side of Manhattan on 57th Street in New New York. The building includes a tower and a hangar, as well as a seaside facility. The tower is directly connected to the rooms, and rooms such as the conference room and Farnsworth's laboratory have a clear view of the hangar behind it. The building is also home to Professor Farnsworth and his clone. At the top of the tower is an attic. There also seems to be a lift from the top of the tower to the bottom of the complex. Below the headquarters is a limestone cavern, where the Professor on occasion uses the elements of the Earth itself to clone things. When exactly the building was constructed remains unknown, but it is safe to say that it was before 2961, when the company was founded (6ACV15). In 3013, the building was modified to be a fire department shortly before being destroyed by a fire (7ACV18). 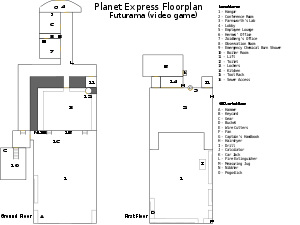 A derived floor plan of the Planet Express building from the game. This is the most consistent placement of the rooms. In the game version, there is no room from the other side of the employee lounge. The Planet Express crew in the hangar. The crew gathered at the conference table. The crew in The Professor's bedroom. Clamps awaiting an interview in the lobby. 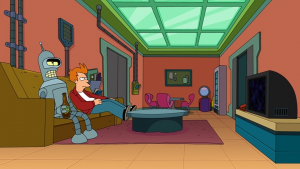 There are many rooms in the Planet Express headquarters, and some rooms also change position whenever the writers need it. And some rooms are only shown once or twice, purely for the purpose of a scene. The attic is a large, round room in which inventions like the Smell-O-Scope are kept (1ACV08). It can be extracted entirely from the building through a cord to perform tasks such as shooting Diamondium at enemies (TBwaBB). It was destroyed in the fire, but was later rebuilt. The largest and most important room and the heart of the operation of Planet Express, in here, the Planet Express ship is kept, which requires no lane to take off, although, there is an option for angling the floor up to assist in a take off of the ship. The hangar has direct access to the conference room and Farnsworth's laboratory. 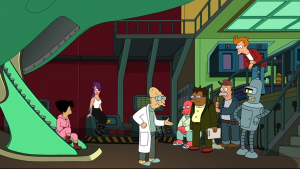 In Futurama (video game), the Hangar is big enough to fit two Planet Express ships in it, but the game is not considered canon. The conference room consists of the conference table, where all meetings at the company are held. The conference room also includes a kitchen from the opposite side of the hangar, as well as a chemical shower. There is also a big monitor, where videos are often shown, especially educational films. A holographic projector is also used frequently. The conference room overlooks the hangar as well, connecting with the employee lounge. The conference room has also been referred to as the "mandatorium" by the Professor. The Chamber of Understanding is a dome where the Professor spends his time trying to understand things. It comes down from the ceiling and doesn't require turning any switch to be activated. A disco ball is also anchored to the top of the dome, and disco music is played when someone is inside the chamber. The situation room is in fact the bathroom in which the professor can be seen taking many baths (many times calling in the crew, the room has a bath, tiles, a sink, and a floating bath toy modelled after the Planet Express Ship). The chart room was shown in "Viva Mars Vegas". It is seemingly stocked with a mass of charts including the floor plan for Wong Hotel & Casino along with others. The interior of the chart room is wooden-looking and seems somewhat different from the rest of the headquarters. The locker room consists of the lockers and also a unisex shower room. The locker room appears to be accessible from the conference room. There is a sign on the door that reads "No pointing and laughing" (BG). Underneath the conference room is Farnsworth's laboratory. In here, Farnsworth spends most of his time working on his many inventions. In "The Inhuman Torch", this room was cleared out and fitted with bunk beds for the crew to sleep in. 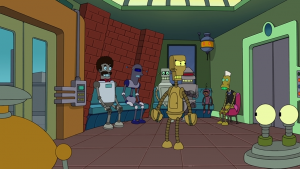 While the rest of their crew live in their own apartments, houses and dumpsters, the Professor and his clone Cubert live at the Planet Express Headquarters permanently. 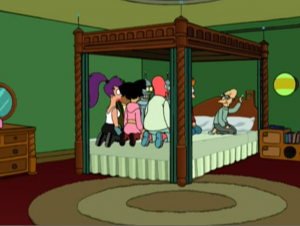 The Professor's bedroom is first seen in "The Lesser of Two Evils", and later again in Bender's Game. Cubert's bedroom was first seen in "A Clockwork Origin". It is also possible that Scruffy lives at the Planet Express Headquarters, since it is shown that he has a bed in "That Darn Katz! ", but it could also just be for resting. Dr. Zoidberg lives in a dumpster just outside the headquarters. Fry and Bender watching The Scary Door. Just inside the front door is the lobby. It is only really used when they are greeting new people; however a small door leads directly into Hermes' office. The main door includes intuitive features such as "slam!". "Employee lounge" redirects here. For the message board, see Planet Express Employee Lounge. The favourite room by the company's employees, where they spend most of the time watching television and hanging out. Besides a TV, there is a coffee table as well as a sofa near the window. At the other end of the room is a dining table and some chairs. While the employee lounge leads to the conference room on one side, the other door seems to lead to whatever the writers find appropriate; the toilet, the kitchen, the hallway, the hangar and much more. Hermes Conrad, being the company's bureaucrat, has his own office, which he keeps tidy for the mandatory inspections that occur now and then. Beside a table, it includes a tube connected to the Central Bureaucracy, a disintegrator and stamp devices of all kinds. His office is located directly underneath the employee lounge. 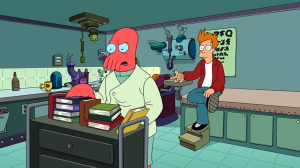 The staff doctor of the company, Dr. Zoidberg has his own office as well, though, Dr. Zoidberg is unfortunately not that knowledgeable of humans, so his office seems to be somewhat strangely furnished, with a diagram of a human upside down. His office also seems to have a depot for the company attached at the back. While usually not in use, Philip J. Fry has on occasion been granted with his own office, located next to the office of Hermes. It first appeared in "How Hermes Requisitioned His Groove Back", after Morgan Proctor promoted Fry to "executive delivery boy". Fry's office later reappeared in "Future Stock". A seldomly visited room wherein a member of the company can describe a certain crime which have been under way at the company, and finally reveal the culprit. The accusing parlour is designed in a dark early 1920s style, reminiscing much like housing in Hercule Poirot's time. With a grandfather clock, bookshelves and of course, big furniture. There is a room with a similar design to the parlour which appeared in "Teenage Mutant Leela's Hurdles" and "31st Century Fox". It has several bookshelves, as well as a moose head. In "The Inhuman Torch", the parlour is shown to be located in the basement of the building. A downstairs room where the plasma-fusion boiler is located. Scruffy often spends time down here, and in can be seen sleeping on the job here in the game. The room is below ground level; directly underneath Hermes' office. It's seen twice. Once in the hangar, and, mysteriously, in Hermes' office (3ACV11). An underground basement accessed via either an elevator or a flight of stairs. A pool of lava sits in the center of the basement, which flows deep into the Earth's core. The leads to it being targeted by certain alien invaders such as the Thubanians (6ACV08) and Flamo (7ACV18). 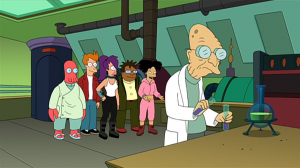 Otherwise, it's typically used for experiments by Amy Wong and Professor Farnsworth and can be used to power the Clone-O-Mat. A bowling alley located deep underneath Planet Express; one floor below the accusing parlour. An exterior dome where the Professor goes when he is angry (4ACV01). On the riverside of the building, there is a balcony where the crew spends time on hot days. The balcony has a Freedom tub, which was once filled with Goat vomit. 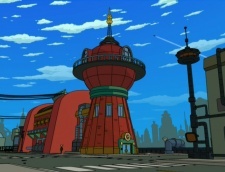 The tower holds many of the Professor's inventions, but before it was used as a control tower to oversee the take-off of the Planet Express ship. The tower is surrounded by a large circular railed platform, known as a widow's walk. 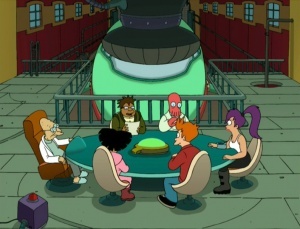 The platform was not constructed with the original building, and was only added after the disappearance of the first Planet Express crew. The Professor keeps vigil on the platform for the return of the crew. The name of the company is integrated as part of the railing, and faces the street. The widow's walk collapsed in the fire. It was eventually rebuilt. The location of the headquarters as seen on Mom's satellite image (BG). 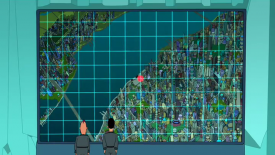 In Bender's Game we learnt the exact location of the Planet Express headquarters, when Mom zooms in on it on a satellite image. David X. Cohen mentions on the commentary of the film that they intended for the location of the building to be on West 57th Street, Manhattan, New New York. Another possible location is the FedEx building on 49th Street. In the present time, all of the waterfront property on the West Side of Manhattan from the Lincoln Tunnel north to 59th Street is dedicated exclusively to the Manhattan Seaport (although this would obviously not be the case in the future). The location of the headquarters, marked by the flame, as seen on a map (7ACV18). In "Viva Mars Vegas", Clamps puts the dumpster on 72nd street, and then the dumpster is shown in front of the ventilation fans on the rear end of the building. That would put the front end (address) of the building one street away. 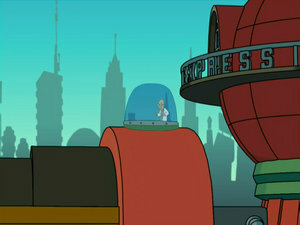 In "A Farewell to Arms", the Planet Express building is also shown to be near 72nd street. In "The Inhuman Torch", the building's location is shown on a map of New New York. This location, however, places the building in the vicinity of Nelson A. Rockefeller Park on the lower West Side. There is a lesbian coven next door (3ACV21), and a Pottery Barn across the street (2ACV14). 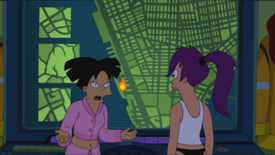 Fry and Leela have also been seen visiting a café directly across the street (3ACV02), and in the commentary, the staff mentioned that it's a pity they don't visit it more often. There is also a pizzeria owned by Cygnoids, in which Bender temporarily gets a job when put into the witness relocation programme (6ACV14). The Planet Express headquarters was voiced by Billy West when it was reconceived in the animation style of classic black-and-white in "Reincarnation". Changed to a Tudor architecture design as a result of the crew's time travel (6ACV23). Planet Express headquarters: Howdy, folks. Come on in! 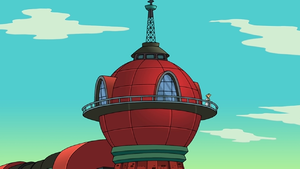 The Planet Express headquarters, along with the company, appears in every episode, comic or film of Futurama as well as the game, with the sole exception of "Where the Buggalo Roam" and "Naturama". This list covers episodes that either feature an alternative version of the headquarters, that reveal new information of the headquarters, or when the headquarters plays a major role in the story. This page was last edited on 28 July 2017, at 01:48.